Los Angeles (AFP) - Boxing superstar Floyd Mayweather on Wednesday scrapped a planned fight with a Japanese kickboxer, claiming he had been duped into agreeing to the contest. 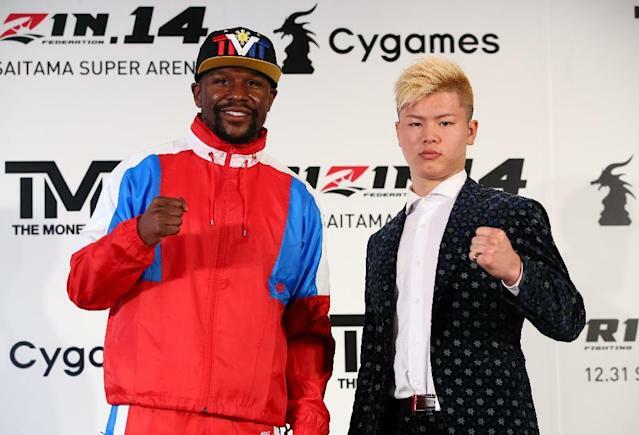 In a lengthy statement posted on social media, Mayweather said he had been "blindsided" by organizers of the proposed bout against Tenshin Nasukawa, set for New Year's Eve in Saitama. The 41-year-old retired welterweight champion said he had travelled to Japan last week to discuss participating in a private bout against Nasukawa for a "small group of wealthy spectators for a very large fee." "This exhibition was previously arranged as a 'Special Bout' purely for entertainment purposes with no intentions of being represented as an official fight nor televised worldwide," Mayweather wrote. Soon after arriving at a press conference in Tokyo on Monday, Mayweather said he and his team "were completely derailed by the new direction this event was going." "We should have put a stop to it immediately," Mayweather wrote. "I want to sincerely apologize to my fans for the very misleading information that was announced during this press conference. "I can assure you that I too was completely blindsided by the arrangements that were being made without my consent or approval." In Tokyo on Monday, Mayweather had vowed to give "blood, sweat and tears" in the fight against Nasukawa. "It's always been a goal of mine to go outside out of the US and display my talent. The world has never seen Mayweather compete live in (Japan)," Mayweather told reporters at the press conference, framing the fight as an expansion of his businesses to the Far East. Mayweather has not fought since his money-spinning boxing showdown with mixed martial arts star Conor McGregor in Las Vegas in 2017. Mayweather returned to retirement following that bout with a perfect 50-0 unbeaten record. However the American has repeatedly hinted at coming out of retirement since that fight, most recently teasing a possible rematch against Filipino icon Manny Pacquiao. Nasukawa, 20, meanwhile, had told reporters on Monday it had been an "easy decision" to agree to fight Mayweather. "It was a surprise offer but I accepted without hesitation," said Nasukawa. "I don't care what the rules are. I want to be the man who changes history. I'll do that with these fists, with one punch -- just watch." Mayweather said he had been reluctant to speak out at Monday's press conference because he did not want "to create a huge disturbance by combating what was being said." "I am a retired boxer that earns an unprecedented amount of money, globally, for appearances, speaking engagements and occasional small exhibitions," he said. US-based pundits however poured scorn on Mayweather's stated reasons for the U-turn. Yahoo Sports combat sports columnist Kevin Iole greeted Mayweather's volte-face with scepticism. "Mayweather is hardly a shrinking violet and he has never — ever — failed to speak up on his own behalf since he became a professional boxer," Iole wrote. "One would have to be a fool to believe this."